Contract Manufacturing Ammunition | Ammo & Bullet Mfg. Inc.
Contract manufacturing of ammunition is a type of service where customers are provided with bulks of ammo either for their personal use or for retail purposes. When looking for places that do contract manufacturing of ammunition, find one that provides nothing but high-quality ammo made in the USA. You don’t want to work with someone who does illegal contract manufacturing of ammunition. Apart from resulting in legal repercussions, using their goods may put your life at risk. Who Provides Quality Contract Manufacturing of Ammunition in the USA? If you’re in need of bullets, and a lot of them, turn to Ammo and Bullet. As our name suggests, we offer contract manufacturing of ammunition as a service. We are a multifaceted ammo manufacturer that caters to entrepreneurs, gun enthusiasts, the military, and law enforcers. What separates us from other companies that do contract manufacturing of ammunition is our passion for it. We are obsessed with perfecting every cartridge that we release. We go the extra mile to ensure every contract manufacturing of ammunition order we get is nothing less than perfect. For information about the ammunition industry, during a time where gun control is a topic of discussion, read this: https://www.nytimes.com/1992/03/20/us/as-gun-debate-rages-ammunition-makers-are-quietly-and-busily-at-work.html. Shooting Clubs: Businesses like firing ranges and shooting clubs need a reliable company that provides contract manufacturing of ammunition. The top reason many shooting clubs choose us for contract manufacturing of ammunition is that we offer them customized solutions. Whether you need lead-free bullets or environmentally friendly ammo, we can make them all. Law Enforcement Agencies: As officers who serve and protect the citizens of this country, you need quality gear to aid you in your duty. Ammo and Bullet offers contract manufacturing of ammunition to law enforcers. Through our contract manufacturing, ammunition rounds including lead-free units, hollow-points, and frangibles can be acquired. Military: When contract manufacturing ammunition for military purposes, reliable isn’t a luxury—it’s a necessity. For the military, precision in every order of contract manufacturing of ammunition is very important. Our soldiers are putting their lives on the line. It is only right that companies are careful when contract manufacturing ammunition for them. At Ammo and Bullet, our goods go through multiple steps before we ship them to the client. To make sure every cartridge in your pack is flawless, here are some of the things we do when contract manufacturing ammunition. Initial Cartridge Checking: When contract manufacturing ammunition, each unit’s powder levels are checked twice via laser sensors. At this stage, we also check if the cartridge length and bullet seating are adjusted with the inline case gauges. If any unit from the set fails, it is rejected, quarantined, and properly disposed of. Second Pass: When contract manufacturing ammunition, calibration and validation are the keys to success. Our lab technicians regularly maintain and calibrate our test barrel sensors and measuring devices used in the contract manufacturing orders we receive. Random Checking: Apart from the state-of-the-art technology we use, we also check the units by hand every time. In every order we process, we get a bunch of random samples and assess them manually. Final Pass: Finally, we check the units before we package, seal, and send them off to the client. Our technicians search the ammunition for any defects while preparing them for shipment. Are you interested in creating your own line of ammunition? Then you should definitely consider working with a company that offers contract manufacturing of ammunition. At Ammo and Bullet, when contract manufacturing ammunition, we make sure that every cartridge is packed with only top-notch materials. We always prioritize the quality of our goods when contract manufacturing ammunition. Clients who need contract manufacturing for ammunition retailing or professional use can contact us to learn more about our services how we can help your business. We are Ammo and Bullet, an ammunition manufacturer based in Arundel, Maine. Our company develops and produces high-quality ammunition for the military, law enforcement, and businesses. We are proud to offer ammunition assembled using top-notch materials and state-of-the-art equipment in the USA. Since we value the lives of the people who use our products, we pay close attention to detail, particularly during our quality control process and each of our services. We use laser sensors to check powder levels. This process is done twice to ensure accuracy. Our company also uses optical micrometers to achieve satisfactory results for cartridge length, bullet seating, and case gauges. If we miss out on any step, big or small, we properly dispose of a cartridge. 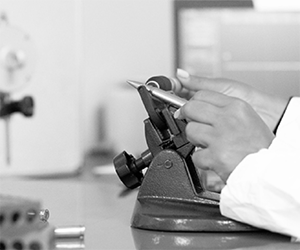 Our lab technicians perform validation for handheld measuring scales and instruments. They also calibrate our test barrel sensors to make sure they meet the requirements of Sporting Arms and Ammunition Manufacturers’ Institute (SAAMI). We have a machine room supervisor who will examine the in-line process measuring devices and make certain that all quality procedures are implemented throughout production. Trust our company when it comes to ammunition development. Feel free to choose from some of our most popular rounds, including 9mm, 45 Auto, .300 Blackout, .223/5.56, and .308/7.62×51. We produce different rounds starting from 9mm up to .338 Lapua, with a specialty for small firearms. Our company produces ammunition for businesses that run rifle ranges and shooting clubs, and we create customized solutions for their unique needs. For example, we can produce green ammo to minimize lead air pollution in indoor training ranges or to comply with new environmental regulations. Are you looking for the right ammunition maker? Look no further than Ammo and Bullet. Call us at (888) 407-0240 to place your orders and to learn more about our products. We are available from 9AM to 5PM. Partner with us, fill out our contact form, and we’ll help you get reliable ammunition.